For fifty years (1949-99) the Giant Yellowknife Gold Mine emitted arsenic air and water pollution into the environment surrounding in Yellowknife, NWT. Arsenic pollution from Giant Mine particularly affected the nearby Yellowknife’s Dene First Nation (YKDFN), who were reliant on local lakes, rivers, and streams for their drinking water and subsistence activities. The closure of the mine in 2004 ended this pollution, but left behind a highly contaminated abandoned mine site. 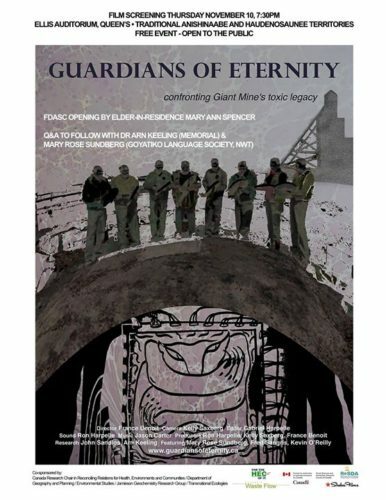 Currently the federal and territorial governments are undertaking a remediation project at Giant Mine to clean up contaminated soils and tailings on the surface and contain 237,000 tonnes of highly toxic arsenic trioxide dust that are stored underground at the Giant Mine. 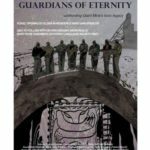 The co-produced film, Guardians of Eternity, documents the Yellowknives Dene experience of toxic exposure and their efforts to address the question of how to warn future generations of the potentially permanent toxic hazards stored below their traditional territory.